On the 6th of December 2014 there was something even more to celebrate than usual. 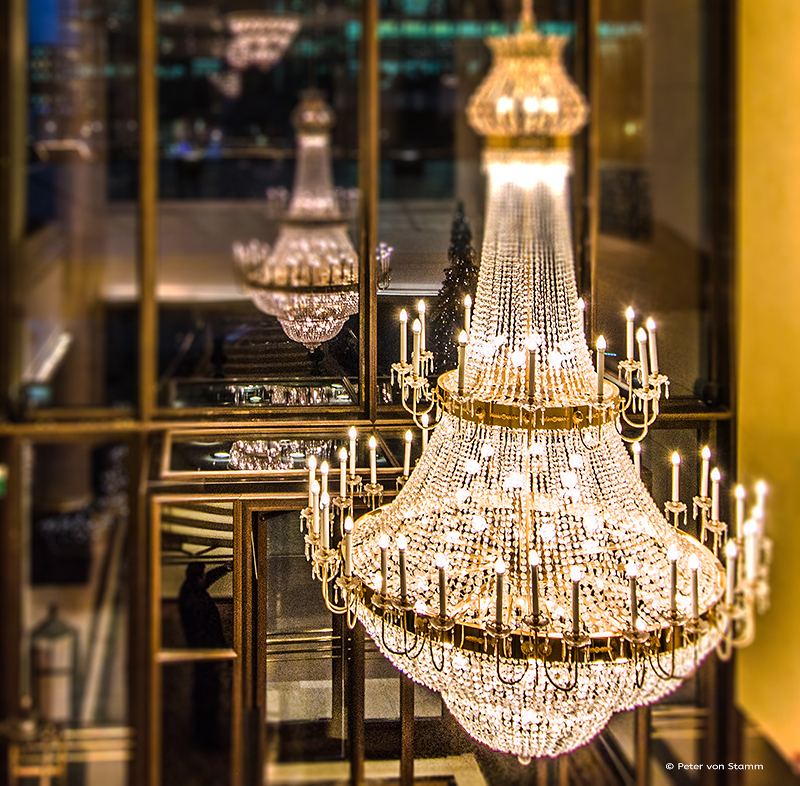 In the 5 star hotel The Ritz-Carlton, Berlin at Potsdamer Platz it is usually the guests who toast with champagne at the exclusive parties, glamorous receptions or intimate get-togethers. But this time it was different. The hotel had something to celebrate. 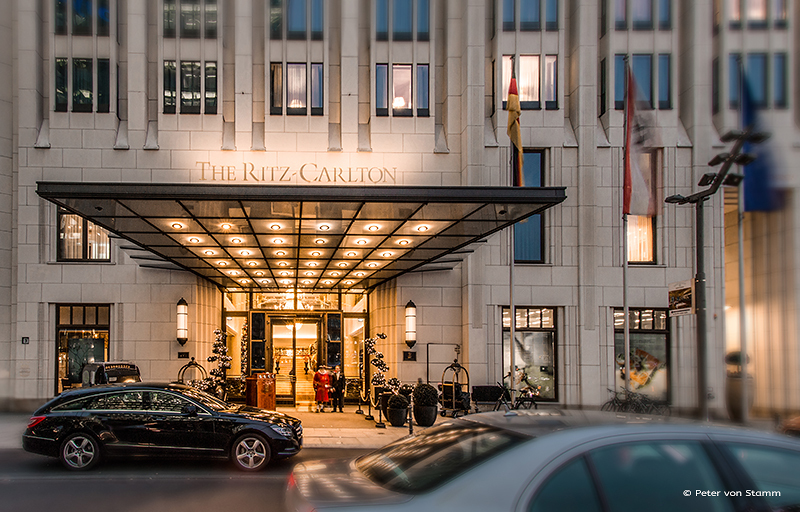 The Ritz-Carlton in Berlin had just been awarded the World Luxury Hotel Award as the Best Luxury Hotel in Germany at a ceremony in Cape Town. So even more reason to put a name to a highly prestigious award and spend some quality time there. 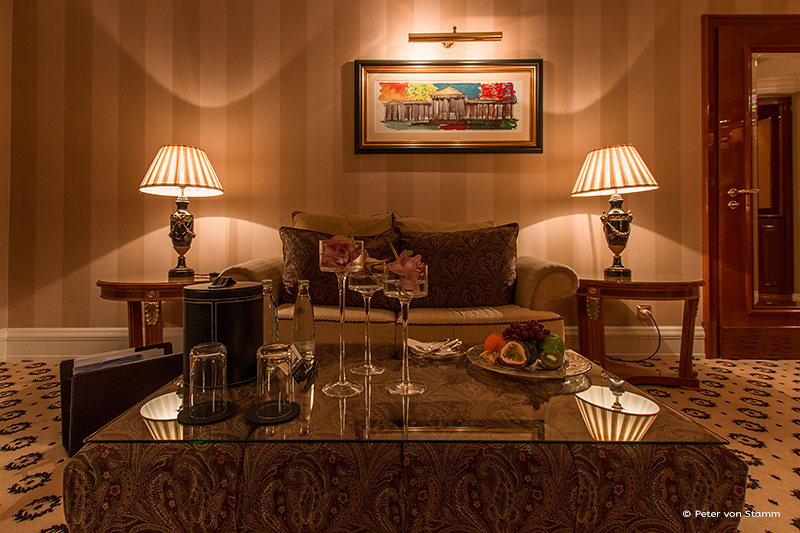 For those who value luxury, first rate service and an elegant ambience you will feel right at home here. 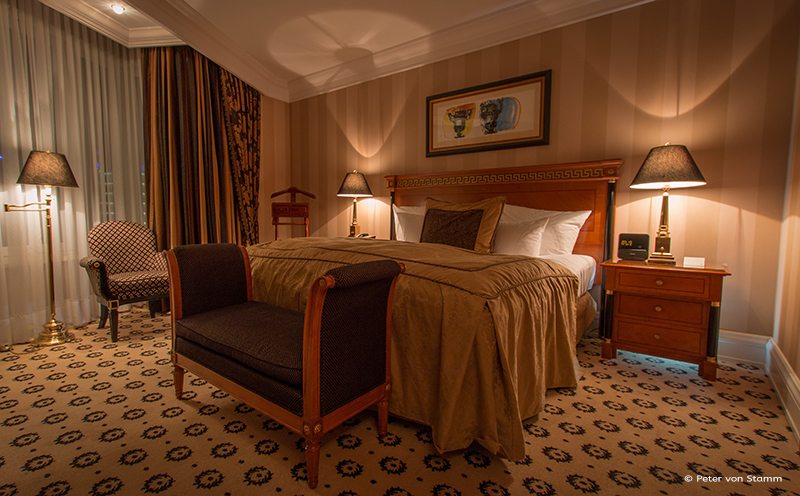 And for those of you who would like to enjoy those comforts within the historical settings of a grand hotel encompassing recent German history, then staying at the The Ritz-Carlton in Berlin will be exactly what you are looking for. 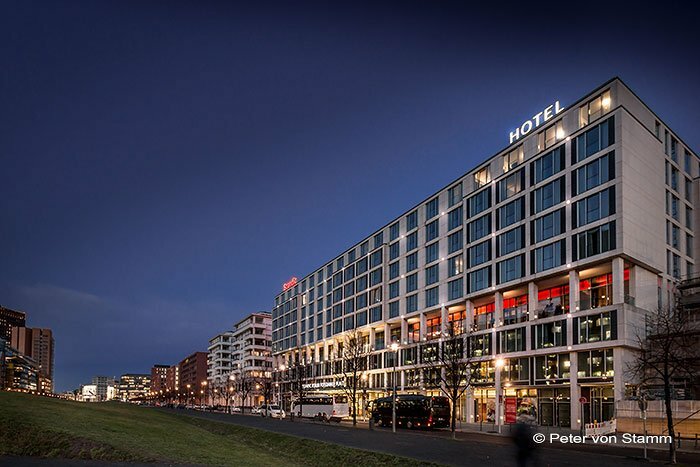 The hotel is situated in the new centre of Berlin, a place with an intriguing past: The Potsdamer Platz. Before the Second World War the public square was a red light district of Berlin with cabarets, bars and hotels. One of the most popular and liveliest public squares in Europe. After the war the square lay in ruins and became the region where three sectors; the Soviet, British and American met. It only took one line drawn into concrete, in the August of 1948 and the first actual “border” was created between East and West. In 1961 the division of the city was literally cemented with the construction of the Berlin Wall. Those in power saw to it that by the middle of the 1970’s nearly all of the remaining buildings were demolished and replaced by high security borders. The widest area from the death strip (Todesstreifen) and the interior wall (Hinterlandmauer) was situated here, making it the most dangerous place to cross. As I visited Berlin for the first time in 1980 and wanted to see the Potsdamer Platz I made my way to one of the make-shift observation decks to take a peek over the wall to the eastern side. I remember a fastfood restaurant, a souvenir shop and several American students who stood with me on that platform and just couldn’t believe their eyes. The Wall, the death strip and the injustices that occurred in the former GDR (East Germany). The coldness that we felt and the dreary grey buildings in the background. The minefield, the separation barriers, the East German Border Troops who prevented people leaving the GDR with armed force. Until November 9th 1989. The end of the GDR had arrived and a new start at Potsdamer Platz, like a phoenix rising from the ashes to this day. November 12th 1989 saw the removal of the first four segments of the 155 kilometre wall using heavy construction equipment; practically at the front door of the would-be Ritz Carlton today. Construction cranes towered above the skies, high-rise buildings, office and apartment blocks, new roads, the Bahn Tower, the Sony Centre and the new Potsdamer Platz train station. Cemented stones running through the city like a tail of breadcrumbs and which remind us of where the wall used to be. And solitary almost cautionary pieces of the wall in front of the hotel serve as photo opportunities for tourists. But which tourist knows exactly where East Berlin stops and West Berlin starts? That part of Potsdamer Platz is a mystery. The Lenné Triangle (Lenné Dreieck); the area between Lenne-, Bellevue- and Ebertstrasse is west of the wall but belonged to the East. So when you leave the Ritz Carlton’s doors and wander 20 metres left, facing the walls remains at the former border, then you are in East Berlin and not as many assume, the West. In this former Russian sector there is a hotel built in American style architecture, with a British style bar (The Curtain Club) and a French restaurant, the “Brasserie Desbrosses”. History can be both exciting and amusing. The Ritz-Carlton in Berlin, open since 2004 is part of the Beisheim Centre: A huge 19 floor and 70 metre high real estate complex including the Hotel Marriott International, two office buildings and the exclusive Tower and Parkside Apartments. The Beisheim Centre’s concept: Living with 5 Star Plus Hotel Service. Which means that the apartment tenants who live above and next to the hotel can take full advantage of the excellent services and infrastructure provided by the hotel. 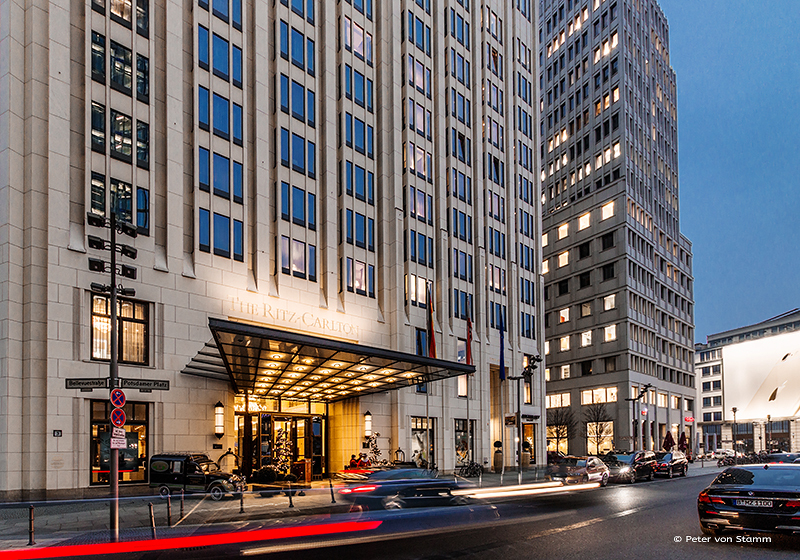 The facade of the hotel reminds us of the Art Deco high-rise buildings of New York and Chicago in the Roaring Twenties. 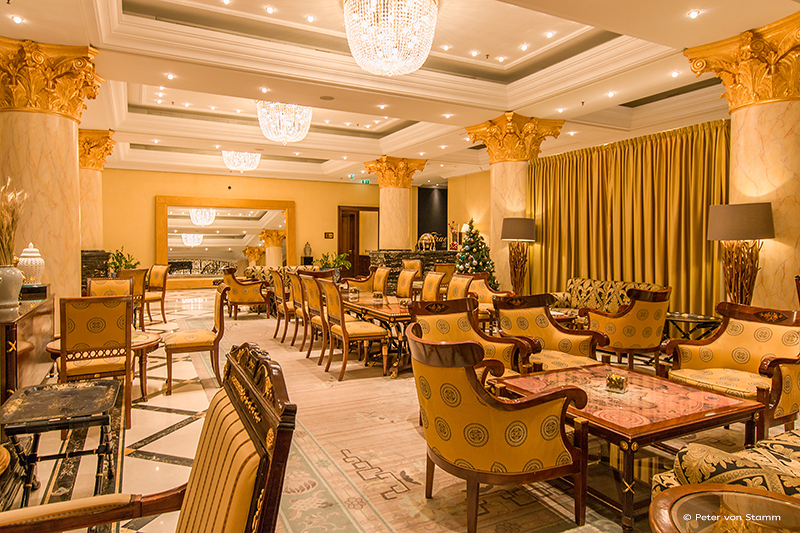 Its interior design is in the classic style of a grand hotel. 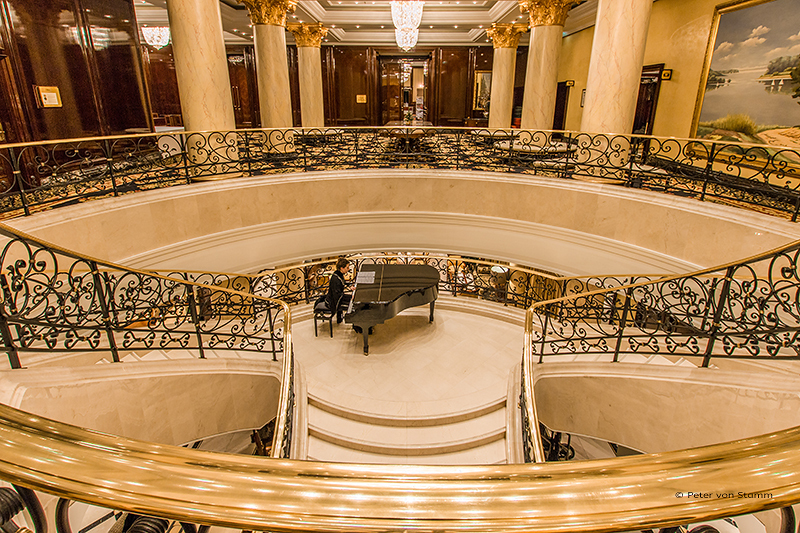 The lobby stretched over two floors and receives guests with a magnificent marble staircase on which melodic tunes from an almost tiny pianist (in comparison to the staircase), can be heard every afternoon from the grand piano situated on the open stairway. 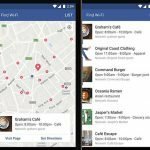 If you choose to stay on the ground floor, passing the reception on your right and the nearby lift area, you will reach the Tea Lounge. A paradise for tea lovers where the traditional afternoon tea is served between 2pm-6pm. 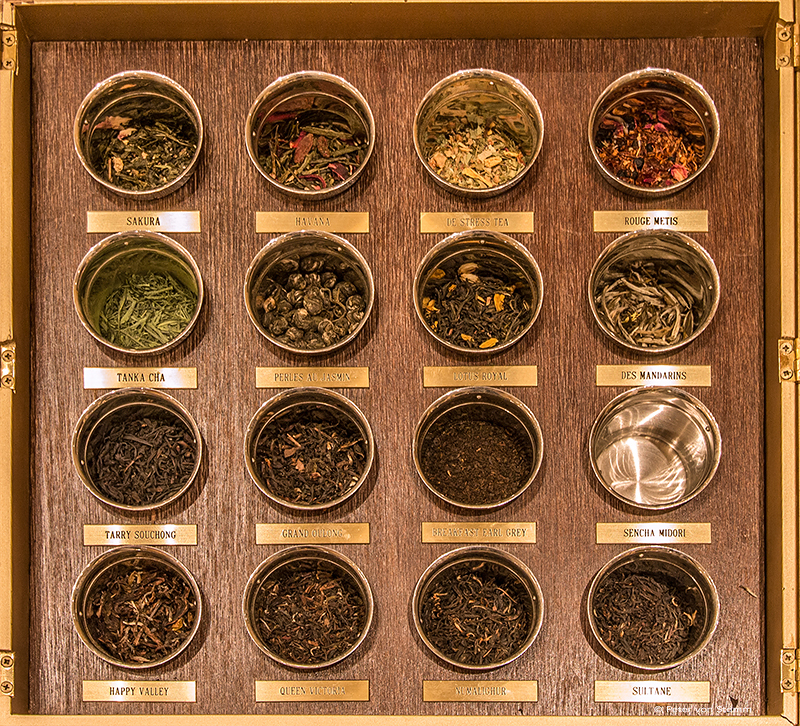 Tucked away from the bustle at reception and accompanied by the subtle piano music from the stairs, no less than 40 different types of tea are presented here by professional tea experts. You can choose English or French style of serving. For the indecisive of you I would highly recommend to guide your nose to the ‚‘Schnupper Schachteln‘, literally translated as the Sniff Boxes. A selection of wooden boxes whose scent knocks you for six in delicious aroma. In such a case a glass of champagne or a brandy is the perfect digestif depending if you have ordered the ladies or the gentleman’s tea. And regarding gentlemen, turning left behind the marble staircase and directly next to the tea lounge is the Curtain Club. 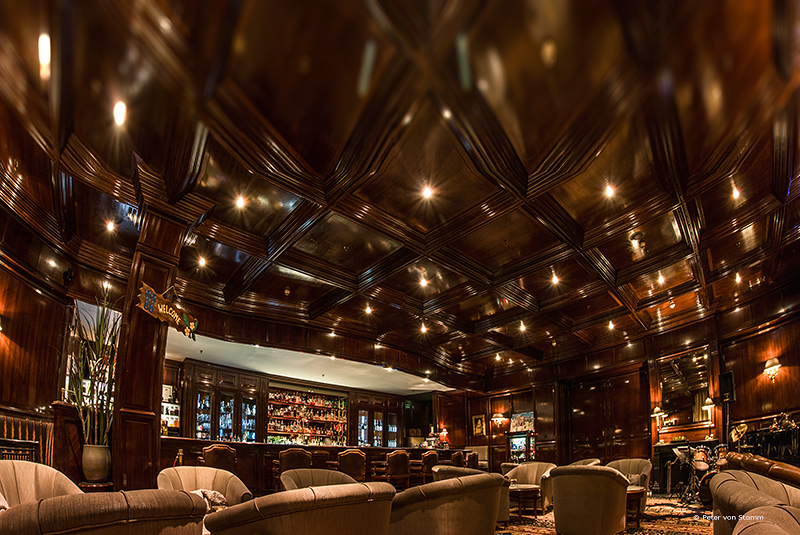 A hotel bar in the style of a British Gentlemans Club. Every evening from 6pm and accompanied by the chimes of a Big-Ben-like clock the heavy curtain is opened by a traditional Beefeater (Tower of London guard). Hence the bar’s name. This is Arnd Heissen’s territory. 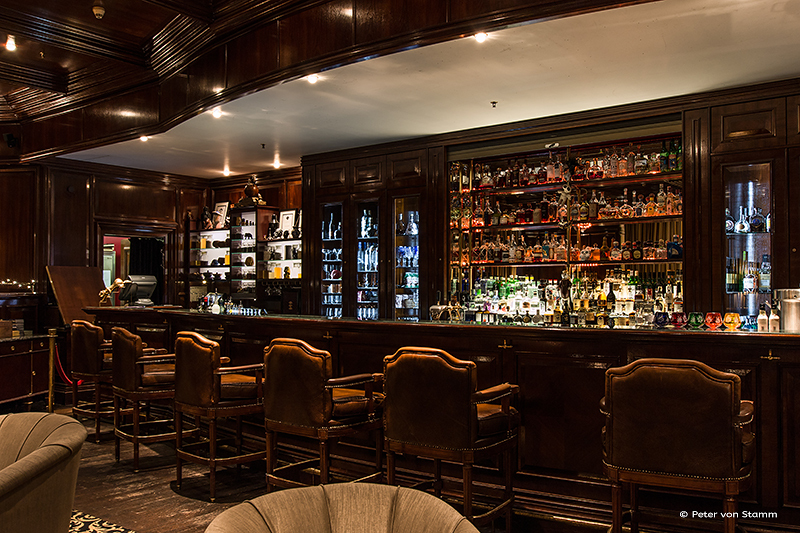 The chief barman here and whose bar was elected the Best Hotel Bar at the renowned Mixology Bar Awards. The Curtain Club is one of the hotel’s highlights. Heavy leather chairs on thick carpets, low-key lighting, excellent service, live music after 9pm Wednesday to Saturday and an inexhaustible choice of cocktails and champagnes. The icing on the cake is Heissen’s cocktail-art fragrance cocktails. Extravagant drinks mixed like perfumes. Cocktails with impressive aromas from flowers, teas, herbs and spices. Creations with names like Hypnose, Herba Fresca or Aqua di Gioia. These cocktails cannot be missed. 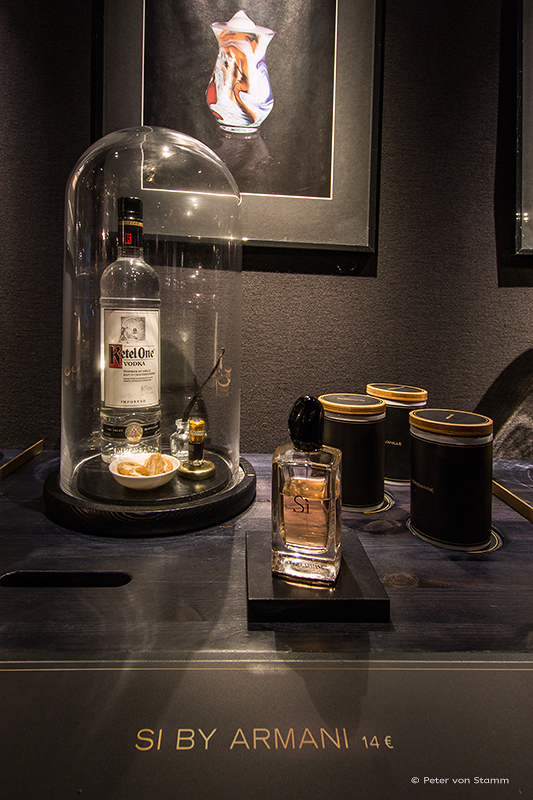 And because of the success of Heissen’s creations there is a second bar; Fragrances which opened in 2014. Fragrances is the first bar which has devoted it’s cocktail art to the world of perfumes. Leaving this one world you are then transported into the next when you enter the Hall of Fame: An array of perfume and aroma bottles, glass cabinets and photos of fantastic perfume cocktails made for perfume brands such as Giorgio Armani, Yves Saint Laurent and Guerlain. Instead of choosing your cocktails from a regular bar menu you can actually sample the scent of your drink beforehand. Next to every bottle is a small container with the ingredients. An absolute must for every cocktail fan and not just for hotel guests. But for those, who like me, visited the Fragrance Bar first and then relaxed to the live music at the Curtain Club I was glad that my room was only a hop skip and a jump away. 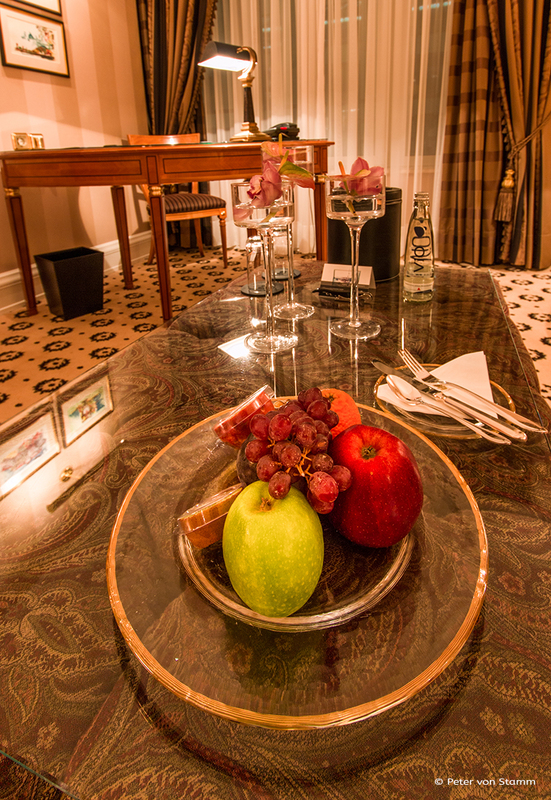 All 303 rooms and suites of The Ritz-Carlton in Berlin are excellently equipped. 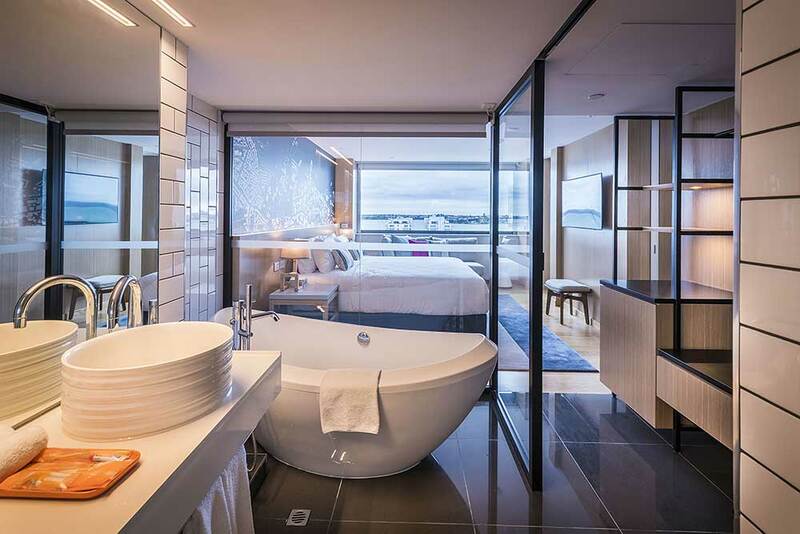 Rooms start at 40 square metres and the suites are up to 200 square metres. 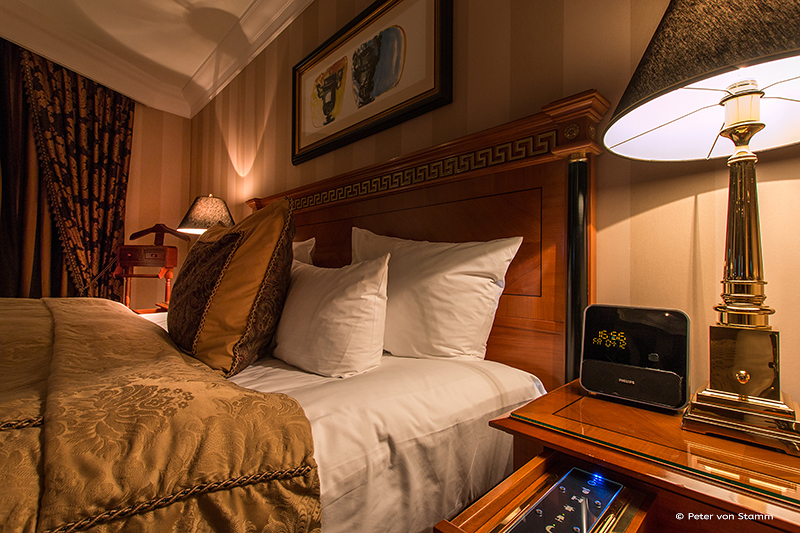 All rooms have touchscreen technology which can be used for the light switch, a Do-not-Disturb sign or room service. My room on the 7th floor, consisted of a generous lounge area with a writing desk, an even more generous bedroom with a king size bed, a large marble bathroom with a double sink, corner bathtub, a very spacious shower as well as a separate guest toilet. An elegant interior design with cherry wood and warm colours. The lounge and bedroom had flatscreen TV’s and a DVD player. At first I had a little difficulty in closing the curtains in the bedroom until I came upon a further exquisite luxury. 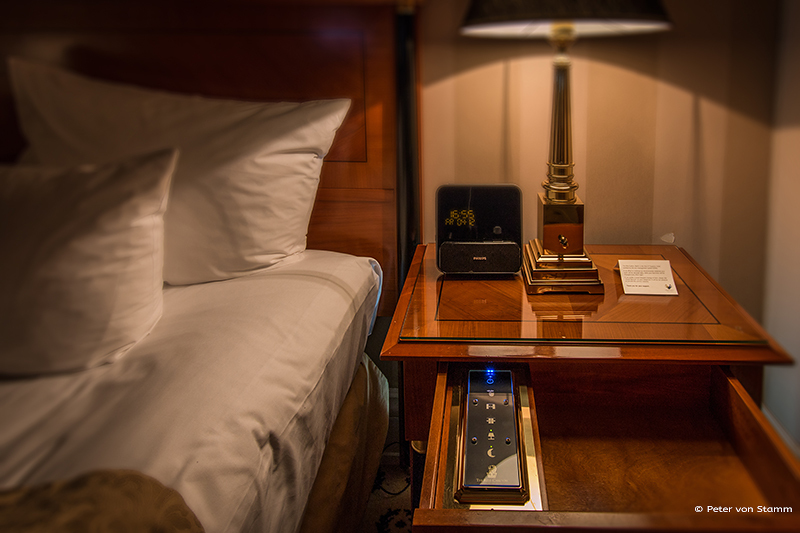 A switch in the drawer of the bedside table which opened and shut your curtains. What more could anyone ask for than a remote control for your curtains! On the 10th floor of the hotel you can find the infamous Club Lounge. A formal and cocooned private salon for suite guests who want to avoid the hotel’s public spaces. Concierges cater to every need of the guests here where privacy is key and lunch, Afternoon Tea, dinner or the fragrance cocktails of course, are not to be missed. Exclusivity is the highest priority. 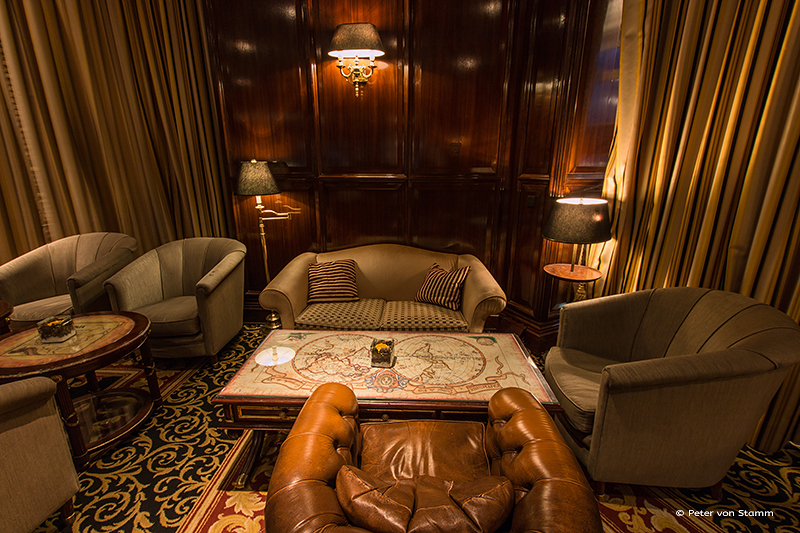 For those of you in search of even more exclusivity, look no further than two floors up on the 12th. 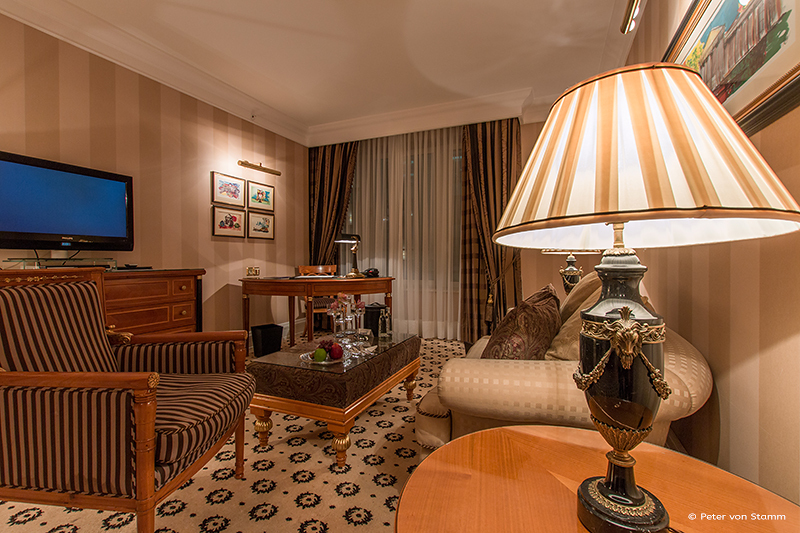 In Berlin’s biggest luxury hotel suite, the 285 square metre Ritz Carlton Apartment. 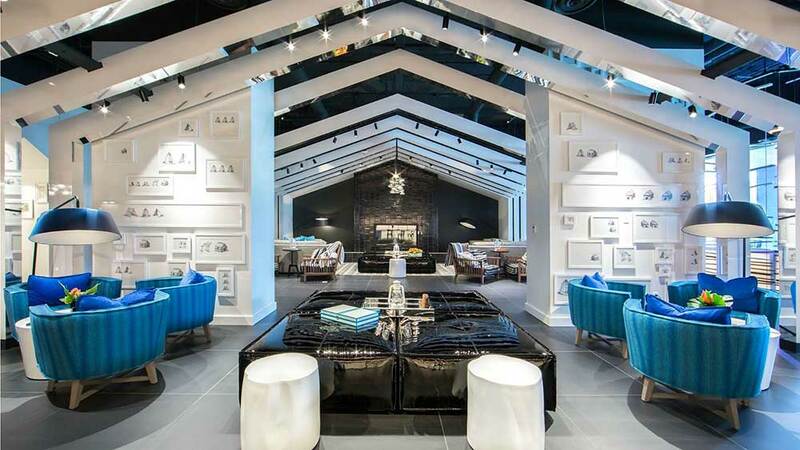 Housing expensive paintings, a fireplace, champagne, a personal assistant and daily culinary creations. 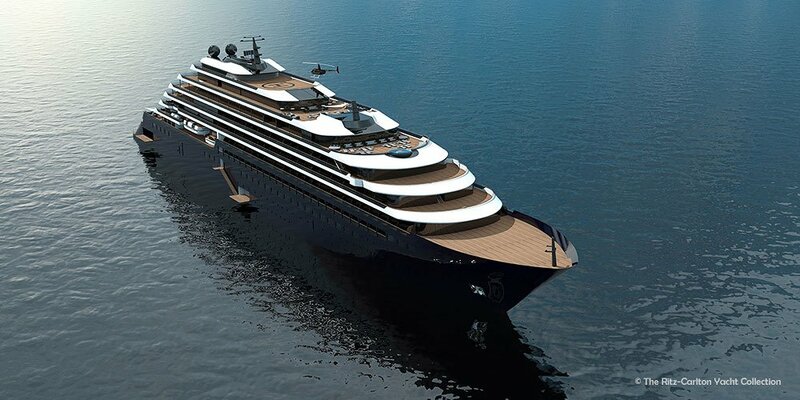 A private lift, a separate telephone system, video security cameras and bulletproof glass provide the added security. But you don’t have to live in this apartment in order to realise why The Ritz-Carlton in Berlin was named the Best Luxury Hotel in Germany. The hotel facilities and the high level of service that I encountered speaks for itself. Chef Concierge Thomas Munko, President of the Golden Key; the Professional Society for the Hotel Porters of Germany was awarded the Concierge of the Year by the British magazine Hotel Management in 2010. Four years later in November 2014 a trainee of The Ritz Carlton in Berlin won the Germany Luxury Hotel Selection Trainee Competition. 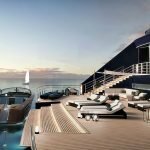 Besides being awarded Germany’s Best Luxury Hotel, the hotel was honoured with the title Germany’s Leading Business Hotel at the World Travel Awards in Athens. The Oscars of the Travel industry so to say. And in 2013 the hotel was honoured with the Reader’s Choice award as Northern Europe’s Best Hotel by the US edition of Conde Nast’s Traveler Magazine. For me it wasn’t just about the hotel itself but the combination of facilities, service, comfort and location. Behind the hotel is not only Berlin’s but Europe’s largest inner-city park, Tiergarten district. A fact not just known and appreciated by the beekeepers who collect the 400 kilos of honey from the roof every year, but also the Ritz Carlton guests who not only want to explore the city but its nature as well. The Brandenburg Gate, the Reichstag and the other historical historic sites are all within walking distance. 10 minutes is all you need to reach the Holocaust Memorial (Memorial to the Murdered Jews of Europe). Many embassies and museums are nearby, the Martin-Gropius Bau isn’t even 10 minutes away and to Checkpoint Charlie, 15 minutes. Berlin’s newest and biggest shopping centre the Mall of Berlin is only a stone’s throw away at Leipziger Platz. And the historical Potsdamer Platz is on your front doorstep. At breakfast the following morning, a lovely location situated next to the show kitchen at the Brasserie Desbrosses; a French Hotel-Restaurant built in 1875 and originally situated in the small Burgundy town of Macon. 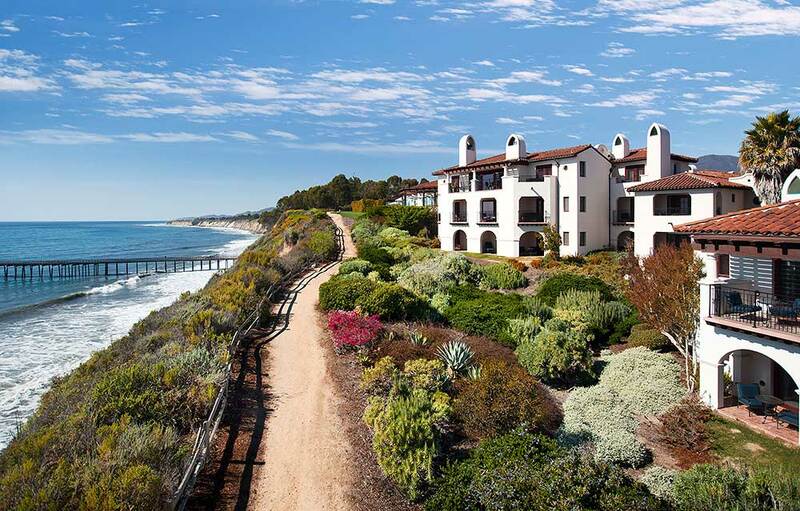 Its inventory was removed and painstakingly rebuilt and restored at the hotel 12 years later. A Russian gentleman is sat with his wife at the table next to me and opposite, a group of Americans armed with laptops. I am reminded of the time I had peered over the Berlin Wall for the first time at this exact same spot. A situation such as this would never have been deemed (or even dreamed) possible at Potsdamer Platz. This is the capital’s old- new centre. The heart of Berlin. 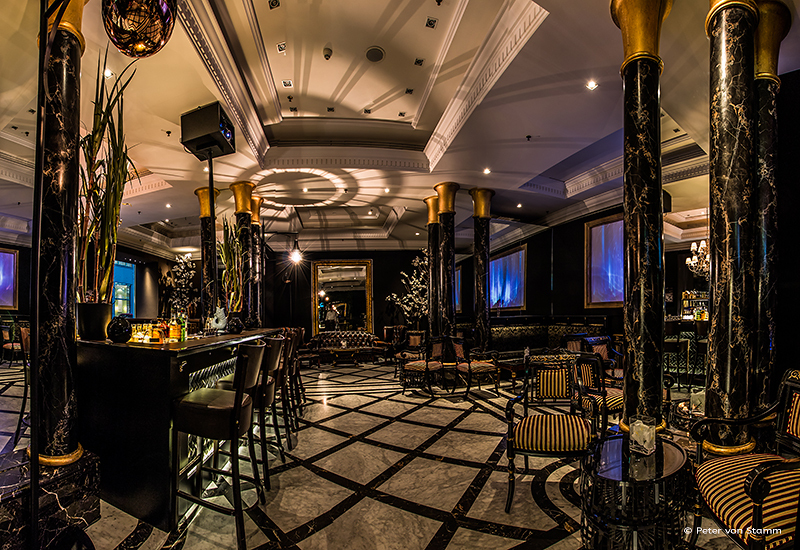 A fitting location for such an exceptional hotel: The Ritz-Carlton in Berlin. Many thanks to Bianca Demsa for the translation!! @petervonstamm what a fantastic article, thank you for taking the time to feature @RitzCarlton #Berlin and thank you for being our guest! 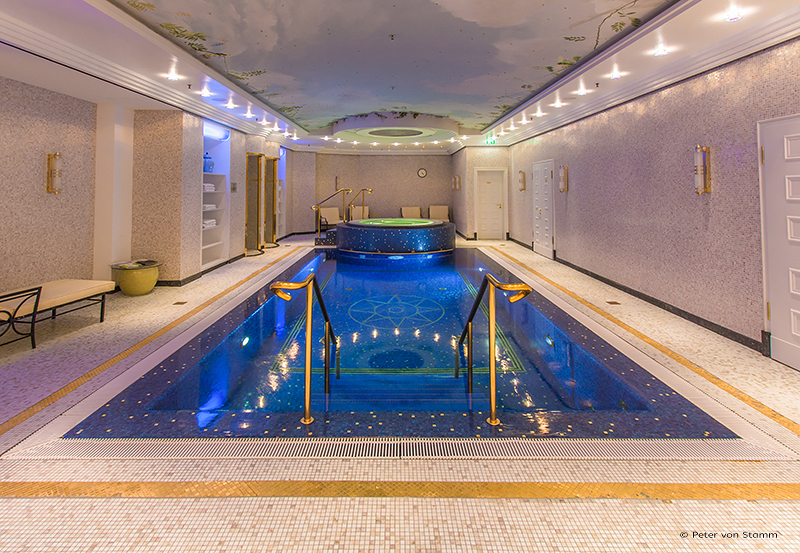 https://petervonstamm-travelblog.com/wp-content/uploads/2015/01/Ritz-Carlton-Berlin-Suite-05a1-1.jpg 533 800 Peter von Stamm https://petervonstamm-travelblog.com/wp-content/uploads/2018/05/petervonstamm-logo.png Peter von Stamm2017-06-30 15:10:122017-07-01 10:04:23The Ritz-Carlton in Berlin: An exceptional hotel at an exceptional location.